Y'all didn't think I'd go a full week without one mention of my impending nuptials did you? Haha! This week, I thought I'd try a twist on the April Showers theme, and show you an outfit that I am dreaming up for a wedding shower or two I'll have in the coming months. I've been on the look-out for the perfect white frock for summer, and I think I've found it in this Lilly number. Pair it with some accessories (and a cute umbrella just in case of a summer shower), and you're good to go. 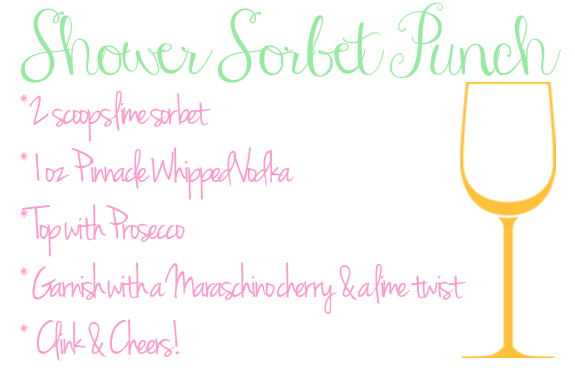 And, to round-out cocktail week, I'm bringing you a shower inspired beverage (adapted from Paula Deen! ): Shower Sorbet Punch. 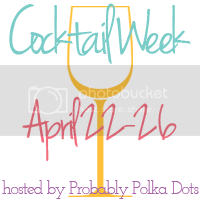 Thank you so much to everyone who linked-up for cocktail week. The link-up is open through Monday if you're interested in adding your post to the mix. I hope you all were inspired in some way. Gather your friends, some cute napkins, a few glasses, and some paper straws (of course!) and have a cocktail party of your own! I love that you went with a bridal shower theme and this outfit is perfect! The punch sounds amazing too! Have a great weekend! LOVE this!!! So cute, and the cocktail sounds perfect! That XO necklace is adorable! Love this collection :) Thanks for sharing your inspiration! Just found your blog. Following you know :) hope you can do the same!! Oh that is so darling! Lilly is great with white dresses-- I have one from last summer and pair it was brightly colored accessories all the time! The drink sounds soooo good!!! And what a cute gift idea! And that dress is just perfect for a bride-to-be... congrats!! Love this outfit! Finding the perfect white dress can definitely be a challenge but I think you hit a home run with this one! Great idea about the gift too. Love it all! Thanks for a great link up!